We're winding down to the fourth post in the Naruko Mini Series, and today's focus is on the Narcissus Eye Cream. As I mentioned in the prior posts, the Narcissus line is targeted for women who are just starting to see the early signs of aging. It's more of an anti-aging preventative line and not an actual anti-wrinkle line. The entire line claims to achieve several things; brightening, moisturizing, firming, ant-wrinkle, and providing antioxidants. 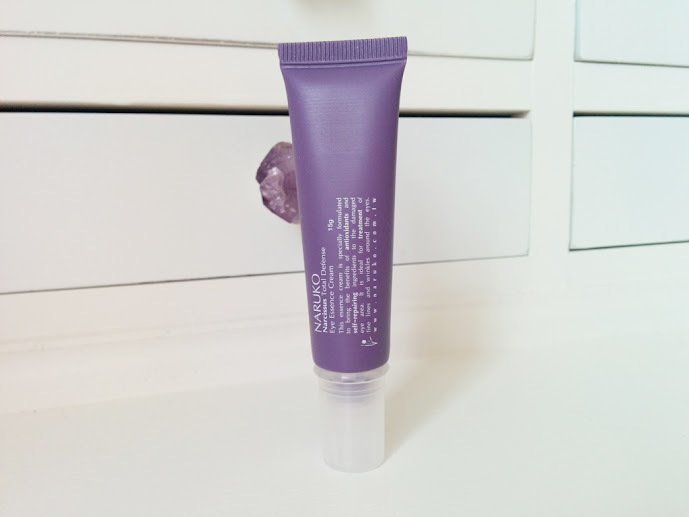 It definitely is not an anti-wrinkle cream (learn the difference between anti-aging and anti-wrinkle here), but it definitely moisturized my under eye area! As I mentioned in my prior post, I wasn't able to bring the packaging along with me when I flew back from California. Luckily, all of the products in the Narcissus line share very similar ingredients. 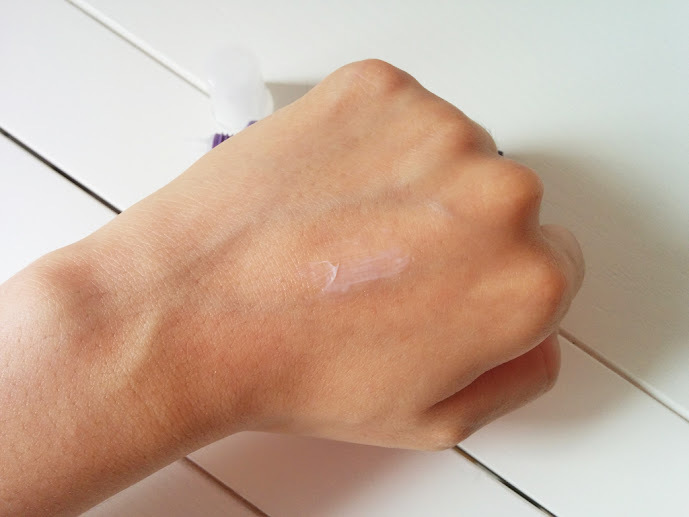 I already reviewed the Narcissus Night Gelly here and listed the ingredients in that post. This essence eye cream is specially formulated to bring the benefits or antioxidants and self-repairing ingredients to the damaged eye area. It is ideal for treatment of fine lines and wrinkles around the eyes. Take a pearl sized amount and gently dab around the eyes with fingers. Comes in a squeezable tube for easy dispensing. 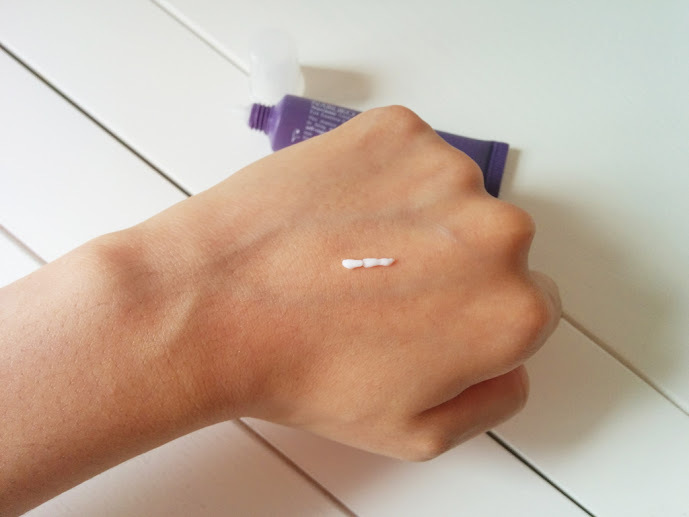 The eye cream is white and fairly thick in consistency. Easily rubs in despite its initial thick texture. I've been using the eye cream for about 2 months now. I apply it once a day during my nightly beauty routine. I apply a small amount and tap it into my skin with my ring finger. I really like the packaging since you can very easily control how much product comes out of the tube. Also, since it's in a squeezable tube, you know you're going to be able to get every last drop of product out. As for the scent, it's been a hit or miss with Naruko products. Fortunately, the eye cream does not have a heavy scent. I can't really smell the product at all so it's perfect for those of you who are adverse to fragrances. The eye cream product I was using before the Narcissus eye cream was Ole Henriksen's Ultimate Eye Lift Gel. Compared to the Ole Henriksen eye gel, this eye cream is lightweight. 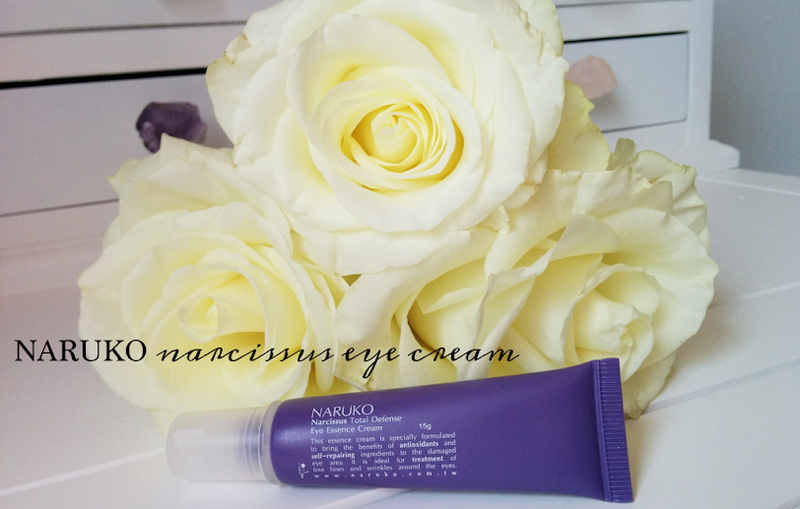 It's obviously summer right now, so using the Narcissus eye cream is ideal since the eye gel tends to leave my under eye area slightly sticky (but extremely hydrated). The eye cream is even light weight enough that you can use it as a makeup primer if you wear under eye concealer. I also put it in my carry on makeup bag and applied it several times throughout my flight without any tackiness or flaking. As for the promises the product claims to deliver, it really only moisturizes the skin. Given, I don't have many wrinkles under my eyes, it hasn't really noticeably helped my very fine lines. It also hasn't brightened my under eye area either. I have noticed that my under eye area is more supple and moisturized after using it routinely over the past 2 months. In the firming department, it might have done that as well, but I see moisturizing the skin and firming as two things that go hand in hand. You usually see the two effects together. You want a light to moderately hydrating eye cream. You like an eye cream that you can layer or serve as a primer. Your skin is dry and needs a more moisturizing eye cream. You want to brighten your under-eye area. 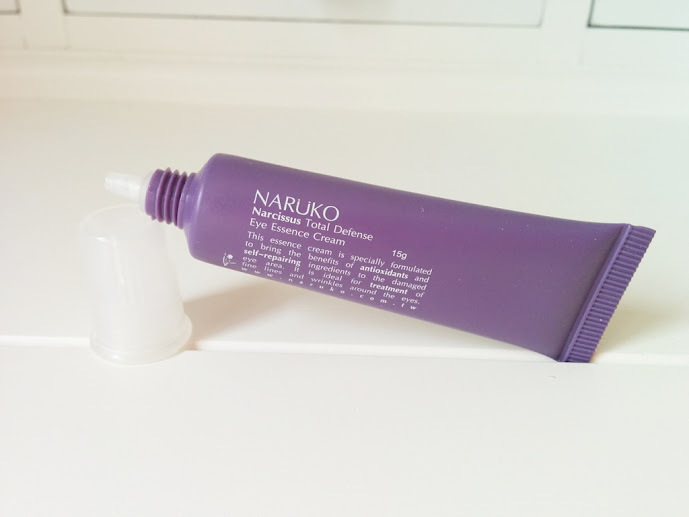 If you're interested in trying out the serum or any other Naruko products, you can purchase Naruko from their online ecommerce site, Amazon, and Sasa. The new renamed version of the eye cream is the Narcissus DNA Repairing Eye Cream. The two creams look similar except the newer packaging is skinnier and taller.